Multi-level parking structures, both above ground and below, can be very complicated. An architect experienced in parking structure design focuses on these three important areas, among others. First, they keep their users in mind. Parking design specialists focus on designing structures that provide their users the highest level of comfort, convenience, and security. Next, they focus on staying within the budget, by minimizing waste of space, designing with constructability, and providing a detailed set of construction documents. They also ensure that they stay within the schedule. Our Riverside Community College District Coil School Parking Structure was built within the budget and on time because our team meticulously factored in these three items during the design process. This 4 level parking garage, with 224 spaces, was designed to accommodate visitor parking for special events at the adjacent Performing Arts Center and for students and staff at the Culinary Arts School nearby. 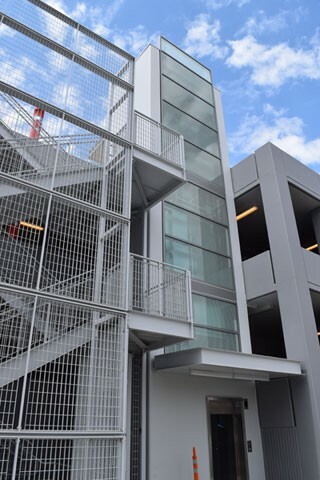 Parking Design Associates (PDA) faced some challenges when designing this structure due to garage site limitations and the elevator and stair access directly connecting to the sidewalk. Security was a major concern and we ensured that security cameras and other safety features were included. By focusing on the students’ and visitors comfort and safety, we designed a beautiful parking structure on time and under budget, that satisfied the Riverside Community College District and met their goals.